Families of active substance abusers and people in recovery may need extra support managing festive but stressful holiday celebrations. Read some sound advice on helping families handle the potential problems. The holidays usually evoke images of family bliss: —Uncle Joe carving up a big turkey for a traditional family dinner, Aunt Mary bestowing her wonderful gifts, Grandmom sharing cherished stories with the children. The reality is that this dreamy scene usually is nothing more than that—a dream. For many families, the holidays can be a time of great anguish, strife, and overindulgent behavior that is later regretted. This stress can be particularly severe for families of active substance abusers or recovering addicts. For these families, the thought of managing substance abuse issues while maintaining peace and unity can be overwhelming—and mishandling these issues can lead to further estrangement from the addict or a relapse for the recovering person. Social workers may find themselves working with these families in the weeks leading up to the holidays or after holiday celebrations have gone awry. 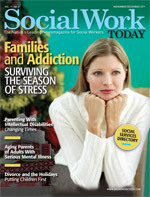 Social Work Today recently contacted several behavioral health and addictions specialists who shared their thoughts on the most pressing issues these families must navigate to make the holidays as enjoyable as possible. Mooney and other experts almost universally agree that one of the most important steps families with substance abuse issues can take is to explore their expectations for the holidays. Far too often, families have expectations that don’t reflect reality but instead are rooted in Norman Rockwell paintings or holiday movies such as White Christmas. Holding onto expectations of perfection—such as that an addicted family member will be magically “cured” over the holidays—can be a recipe for disaster, says Karen Khaleghi, PhD, cofounder of Creative Care Malibu, a California-based treatment services provider. That’s because the inability of a family member to meet these expectations can lead to even more frustration, stress, and despair among his or her relatives. False expectations can be built up around the recovering addict as well. Once a loved one goes into recovery, his or her family members often expect the person to be joyous and outgoing when he or she actually may be struggling with the effects of living without the drug of choice, says Jonathan Katz, LCSW, director of Jewish Community Services, which is part of the New York-based Jewish Board of Family and Children’s Services. Many families with members who are actively using may think the best approach is to ban these people from holiday celebrations. But the decision to ban such family members is not as clear-cut as it sounds, says Marti MacGibbon, CADC-II, CADAC-II, ACRPS, a California- and Indiana-based author and addiction treatment specialist. In fact, a ban may backfire because it may increase the estrangement, isolation, and shame the addict feels. That, in turn, may drive the addict deeper into substance abuse. However, family members have the right to be concerned about the physical and emotional safety of others—especially children—who may attend holiday gatherings with an actively using person. If a family decides to allow an addict to attend gatherings, firm ground rules and expectations of behavior should be set and clearly communicated to the substance abuser, says Donna M. Hunter, LCSW, CAP, who has a private practice in Booneville, AR. And families need to follow through with the consequences if a boundary is crossed or risk further enabling the addict, she says. Families also must face the possibility that an addict does not want to attend holiday functions because he or she finds the experience too painful. In that case, the best course of action may be to reach a mutual agreement that the holidays may not be the best time to get together and may only make things worse, Khaleghi says. Another tricky issue is whether the holidays are a bad time for a family intervention or whether it is the perfect opportunity. Mooney believes the holidays can be a good time for a family to confront an addict because the holidays often are one of the only times of the year when family members are together in the same place. “It’s a great way to get somebody’s attention when his or her family is willing to do this during the holidays,” he says. When family members see a loved one struggling with addiction right in front of them during the holidays, it may be tempting to jump in and intervene. But any successful intervention must be planned, no matter when it is carried out, Khaleghi says. It is natural for a family to be concerned that a loved one recovering from an addiction may relapse over the holidays. Katz says the family’s approach to relapse prevention must be balanced—one that takes the threat of relapse seriously without stifling the recovering person’s ability to enjoy the season. “Hovering around the recovered person is going to put everyone under tremendous stress,” he says. Relapse prevention should begin before the holidays, says Nzinga Harrison, MD, medical director for Georgia services with California-based Anka Behavioral Health. Families should sit down with their recovering members and ask them what can be done to make them feel comfortable during the holidays, what challenges they foresee, and whether there is anything that may trigger cravings for drugs or alcohol. It also is helpful for a family to discuss these issues with a recovering addict’s sponsor and attend Alcoholics Anonymous (AA) or Narcotics Anonymous (NA) meetings to connect with other families. The holidays can be especially stressful for recovering alcoholics because alcohol is a central part of many celebrations. Families trying to help keep their loved ones sober should avoid things such as cooking with alcohol or serving liqueur-filled chocolates, which may inadvertently expose the recovering person to alcohol, Katz says. He also suggests serving attractive and flavorful nonalcoholic beverages so the person in recovery is not limited to water or sodas. Although families may be tempted to ban alcohol outright from their celebrations, this is not necessarily the best approach, Hunter says. Families should realize that not all of the members may be happy with the presence of the recovering person. For example, family members who were treated badly by the individual while he or she was using may angrily air grievances that have been bottled up for years, Katz says. And some family members may resist the recovering person because that person’s sobriety exposes the addiction of other family members, Khaleghi says. If a loved one does relapse, the family needs to confront it and take action, MacGibbon says. Among the steps that can be taken are contacting the person’s sponsor, taking him or her to AA or NA meetings, and offering to take the person to a treatment facility. The key is to take the relapse seriously without overreacting so much that it causes the user to feel crushing guilt or shame, Katz says. No matter what types of addiction-related challenges families face during the holidays, they won’t be well equipped physically or emotionally to handle these challenges unless they find time for self-care, says Kimberly Dennis, MD, medical director at Timberline Knolls residential treatment center in Lemont, IL. Some good self-care strategies include getting adequate sleep, eating a well-balanced and nutritious variety of food, engaging in regular exercise, and taking time for quiet restoration. In addition, family members may want to attend an AA or NA meeting or reach out to people with whom they can share their experience. Family members must realize they can do only so much to bring an addict into treatment or help keep a recovering addict clean and sober, Khaleghi says. That can be especially difficult to accept when a family has seen a loved one recover and relapse over and over again. It may be extremely difficult, but families must come to peace with the idea that an addicted family member often needs to reach a personal low to finally make a change and accept recovery, Mooney says. — Christina Reardon, MSW, LSW, is a freelance writer based in Harrisburg, PA, and a contributing editor at Social Work Today. • Prepare ahead of time. Recovering addicts should assemble a “recovery kit” they can take with them before joining their families for holiday celebrations, says Robert W. Mooney, MD, an addiction psychiatrist and medical director at Willingway Hospital in Statesboro, GA. At a bare minimum, this kit should include the contact information for the recovering person’s sponsor and a backup. Recovering people who are traveling out of town also should bring reading material, such as the Alcohol Anonymous Big Book and books of daily meditations, and attend support meetings available at their destination. • Arrive early, leave early. People in recovery who are attending holiday parties should consider arriving and leaving early since alcohol and drug use typically becomes more prevalent as the party wears on. Recovering addicts should not worry that an early departure will offend the host, Mooney says. • Bring beverages. Mooney encourages recovering addicts, especially recovering alcoholics, to bring their own beverages to holiday parties. That will allow the person in recovery to have more control over what he or she drinks and not fall victim to other attendees’ attempts to spike beverages with alcohol or drugs as a joke. • Have an escape plan. If a situation arises at a family gathering, such as an argument or pressure from relatives to drink alcohol, the recovering person may feel tempted to relapse, and he or she needs to take corrective action as quickly as possible, says Donna M. Hunter, LCSW, CAP, a social worker in Booneville, AR. “I tell people in recovery that if they feel uncomfortable or feel that they need to use again because of the family situation, they need to get out or do what they need to do to maintain their sobriety because ultimately,that’s what’s most important,” she says. Recovering people must remember that they are the ones who control whether they will relapse during the holidays, Mooney says. “They have to realize that it’s not the family’s responsibility to keep them sober; it’s their responsibility,” he says.